Some days, you get a real craving for sweets. Other days it’s meat. Some days it’s a big bowl of kale…okay, it’s almost never going to be a bowl of kale. But at least it’s not rocks…unless it’s rock candy…that stuff is good. Sableye is a Basic Darkness Pokemon, 70 HP, with no Weakness or Resistance and a Retreat Cost of 1. Ultimately, this is an updated version of the card from EX Crystal Guardians, complete with HP boost and some minor stat tweaks. His Disable attack is a 1-for-10 that lets you stop your opponent from using one of their Pokemon’s attacks on their next turn. And then there’s the Ability Excavate, which lets you look at the top card of your deck, and if you want, you can discard it. …so clearly we can see why we’re looking at Sableye. It reminds me a lot of the “excavate” mechanic from Yugioh, which functionally does something similarly – though that one requires you to reveal the cards rather than just look at them, and usually the effects tended to send the cards to the Graveyard (GY) if they did or didn’t meet certain criteria, but that’s all for another game. In terms of Pokemon, what does this do? Simply put, it lets you get a preview of what’s to come. You can look at the next card you’ll draw and be able to plan your strategy accordingly. You could also send that card to the discard pile, letting you utilize it for other cards like Energy accelerators if it’s Energy or for VS Seeker if it’s a Supporter. In fact, Sableye combos fairly well with Magcargo as a deck thinner for that very reason! Interestingly, this card did see play in one of the most famous decks back in the day – the deck known as Intimidation. Piloted by Tristan Robinson, the deck focused primarily around Scizor (MD) as the attacker, and it was made solely to counter other powerful cards at the time. You could call this an “anti-meta” deck – a deck centered around countering the most popular decks at the time. 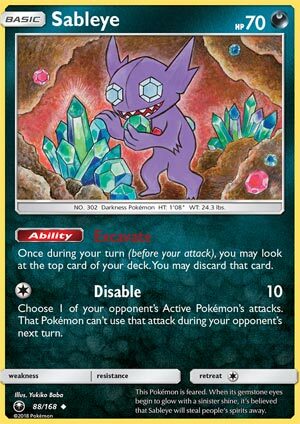 Sableye would play a fairly minor role in the deck, allowing Tristan to set up his next turn with its Excavate before systematically depleting their resources or else punishing them for using Special Energies. This eventually led him to taking the 2008 World Championship title for the Junior Division. So needless to say, don’t underestimate Sableye’s Ability – it could end up proving fairly useful. Arora Notealus: Sableye has a great Ability that works well with different strategies, but most of the time, it’s going to come down to whether or not those strategies are worth running a Sableye in. Some might figure he’s a little slow pre-rotation, and in post-rotation, he’s still got to contend with being a vulnerable target on the Bench. Still, if Magcargo could do well, Sableye might not be that far behind. Next Time: The psychic duo bounds back to the forefront to challenge the world! Sableye excels at on thing: giving you information! This is due to its ability called Excavate, which lets you look at the top card of your deck, and you can either discard that card or put it back on top (assuming the wording printed on that card; I didn’t see any part saying shuffle your deck). This makes it that you can possibly thin your deck a little as well as employing strategies revolving the discard pile. And if the card that you drew is useless or essential to be in the discard, then go right ahead! Top deck a Basic Energy? Discard that and recover later. Top deck a Pokémon? Discard it to fuel up Night March or vengeance style attacks. Overall, a good ability that missed out of being in the top 10 Celestial Storm cards. Sableye (CES 88) shirks its way back into the format in the Celestial Storm expansion set. For every deck that can use its discard pile, Sableye provides a valuable way for you to facilitate delivery of cards to that area. Its ability Excavate allows you to look at the top card of your deck. You may then either return the card to the top of your deck or discard it. Obviously, this pairs wonderfully with Magcargo or Mallow, and Banette GX, Malamar, and maybe even Electrode GX would benefit from the usage of this card. You could use it also at the end of your turn before attacking to see what your next turn’s top deck will be (and dump it if you don’t like it). Get a couple of Sableye on your bench, and that could really help you thin through your deck. I haven’t tried this yet, but I could see it being a valuable resource and a creative addition to some archetypes that will undoubtedly help them increase their win percentage. Definitely looking forward to trying this soon, I think this is a sleeper card that we’ve missed on so far. Our lucky 13th place card is the staple that could have been, Sableye (SM – Celestial Storm 88/168). Showing up on three individual reviewer lists to earn 42 voting points, Sableye was my personal 14th place pick. This Basic, [D] Pokémon has 70 HP, no Weakness, no Resistance, Retreat Cost [C], the Ability “Excavate”, and the attack “Disable”. Excavate lets you look at the top card of your deck, then gives you the option of leaving it or discarding it. Disable costs [C] and does 10 damage, plus it has you pick one of your opponent’s Active Pokémon’s attacks and your opponent cannot use that attack during his or her next turn. Just maybe, you already know where I’m going with this, but Excavate is valuable. Top card something valuable? Leave it there and do not to use a shuffle-and-draw effect. Something you want in the discard pile? Even decks that don’t have discard pile-based combos often will have unneeded cards for a particular game, either because they are counters for something your opponent isn’t playing or spare copies it turns out you don’t need this time. For better and worse, the rest of the package matters as well. Slap Excavate on a Stage 1 or Stage 2 and it just isn’t worth it. It’s on a Basic Pokémon, so Sableye is easy to slip into most decks. The Retreat (and HP) are low enough that Sableye shouldn’t get stranded up front, and with an Escape Board, it’ll have a free Retreat Cost. Nothing huge, but post-rotation that could really matter. While it’s fairly fragile at 70 HP, at least the lack of Weakness means it isn’t as bad as most other 70 HP Pokémon. The attack gives you a small chance of stalling, though even against something with a single attack your opponent just needs to do-si-do with a pivot Pokémon to shake it. There’s a lot about this card that could be better, but it had what it needed to become at least a loose staple for decks post-rotation, though now that we’ve seen Worlds, I guess it wasn’t worth it pre-rotation. So what have I been dancing around? While it requires running a 90 HP Stage 1 with a WORSE attack, the Bench (and deck) space I’d put towards Sableye belongs to Magcargo (SM – Celestial Storm 24/168). Sure, Magcargo cannot discard a useless card directly, but its “Smooth Over” Ability lets you pick what card from your deck is going to be on top. Guarantee something useful is your next draw, or if you do need to discard something, get something to discard cards lined up one turn and then what you wish to discard the next (if you even need to do both). Of course, Magcargo wasn’t in any top eight decks at Worlds, even looking at all three age brackets; could mean I’ve been wrong about it the entire time, but I think it just means I sold Garbodor (XY – BREAKpoint 57/122) short as a partner for Zoroark-GX. We aren’t keeping that Garbodor for SM-On. I could still be wrong about Margcargo, but unless Alolan Muk is suddenly everywhere, that would leave things wide open for Sableye. If I’m right about Magcargo, Sableye will still show up in a few decks; some decks just won’t have even two slots for a 1-1 Magcargo line or would prefer that go to a more reliable pair of Sableye. After all, a good, reliable deck might be slightly more enhanced by a yay-or-nay look at the top card than controlling the top card, when you factor in the rest of the Pokémon involved. I’m not convinced that every Expanded deck should run Magcargo, which actually gives Sableye solid prospects. I’m also thinking decks are more used to working with the discard pile here, so discarding things you don’t need now to use later is a lot more viable e.g. VS Seeker. For the Limited Format, Sableye is nearly a must-run, and a high performing one at that. Pulled the right kind of Basic Pokémon-GX to build your entire deck around, to the point of excluding of running any other Basic Pokémon? Yeah, skip Sableye. Everything else? When you’re deck is likely higher on filler and lower on draw/search, Excavate is brilliant. Being a 70 HP Basic with no Weakness and Disable is also fairly good here, as well.